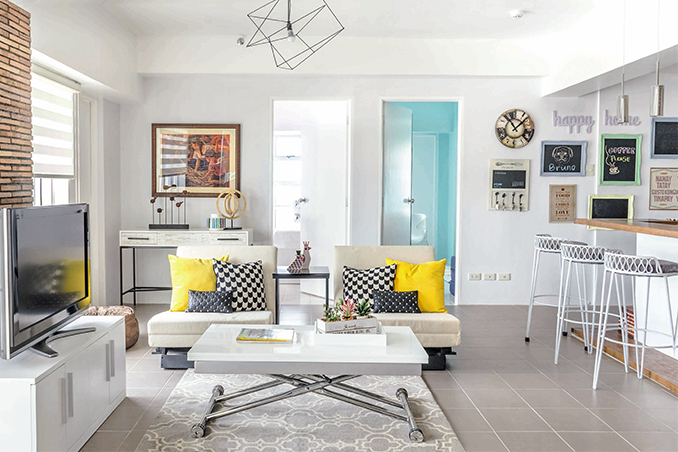 Take a Peek Inside this Colorful, City-Chic Condo....in the Heart of Tagaytay! After meeting her friends at the nearby Franciscan Missionaries of Mary convent in Tagaytay, the homeowner stumbled upon this residential building. Since it was conveniently located near the church and she felt that it would be a good home, she eventually decided to invest in one of the 70sqm units. To make her brand new haven ideal for her, her sisters, and her nieces, the homeowner hired her niece, interior designer Erika Uichanco. Erika created more space by turning the three-bedroom property into a two-bedroom unit. She also made it feel open and airy by changing the kitchen and dining area layouts. Read the original article in the September 2015 issue of Real Living Magazine. Download your digital copy of Real Living on the Real Living App. Log on to summitnewsstand.com.ph/real-living for more details.